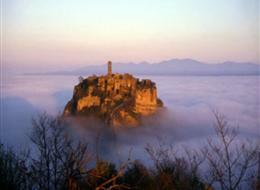 Natalie Reuss will direct, produce and shoot a poetic, observational film about the ancient Italian hill town, Civita di Bagnoregio (Civita). Known as both the enchanted city in the sky and citta che muore – the dying city, Civita rises from the valley floor it is isolated from as a result of centuries of earthquakes and erosion. Despite eternal weathering, erosion and loss of whole neighborhoods to violent earthquakes, people have carried on living in Civita as their ancestors did century after century. While the physical and social underpinnings of the city in the sky are fragile, Civita resists identification as the dying city and yearns for a renaissance. Just as life in Civita has always been closely related to the weather and changing seasons, Reuss’s camera will observe life lived in Civita over the course of a year – winter to spring, spring to summer, summer to fall, fall to winter. Her camera will focus on a seasonal sun playing its games of extending and attenuating light over medieval structures – the piazza, arched doorways and single surviving walls of houses set on sheer precipices; centuries old chestnut and olive orchards groves, vineyards and bushes of wild rose, all of which, in addition to bearing fruit and flower, help bind and retain the hill Civita rests on, preventing further erosion; construction of colossal projects that nurture preservation and environmental sustainability; tourists when the season is high and pedestrian traffic swells from dozens to thousands; Antonio, a last winemaker; Vittoria, ninety, picking through her childhood memories; and Carlo, whose family roots are deep in Civita but now lives in the valley below, his love of Civita so great he makes a special trip to the belvedere to cast his eyes on the ancient profile every morning before going to work. He looks out at the view and flocks of beautiful birds that soar overhead, paying his respects, stirring his memory, keeping that living thread of hill town life that wears so thin these days.